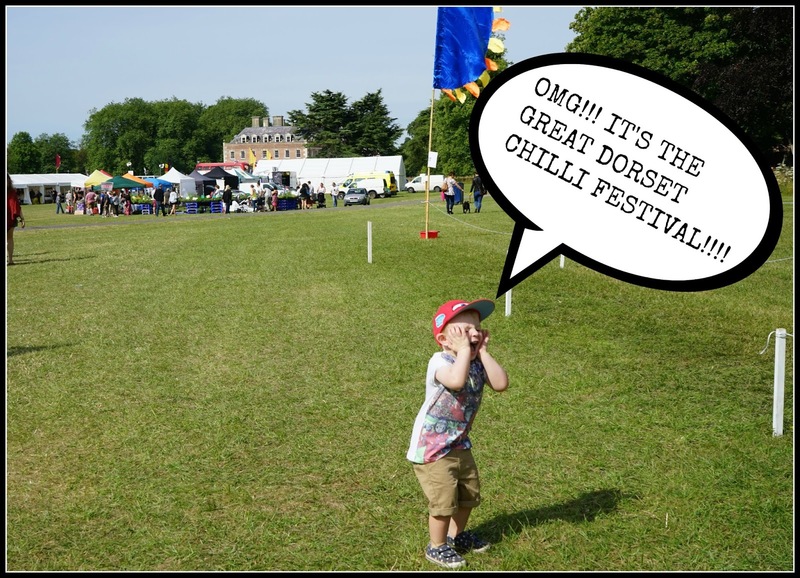 Entertaining Elliot: Feeling Hot Hot Hot at the Great Dorset Chilli Festival! Feeling Hot Hot Hot at the Great Dorset Chilli Festival! 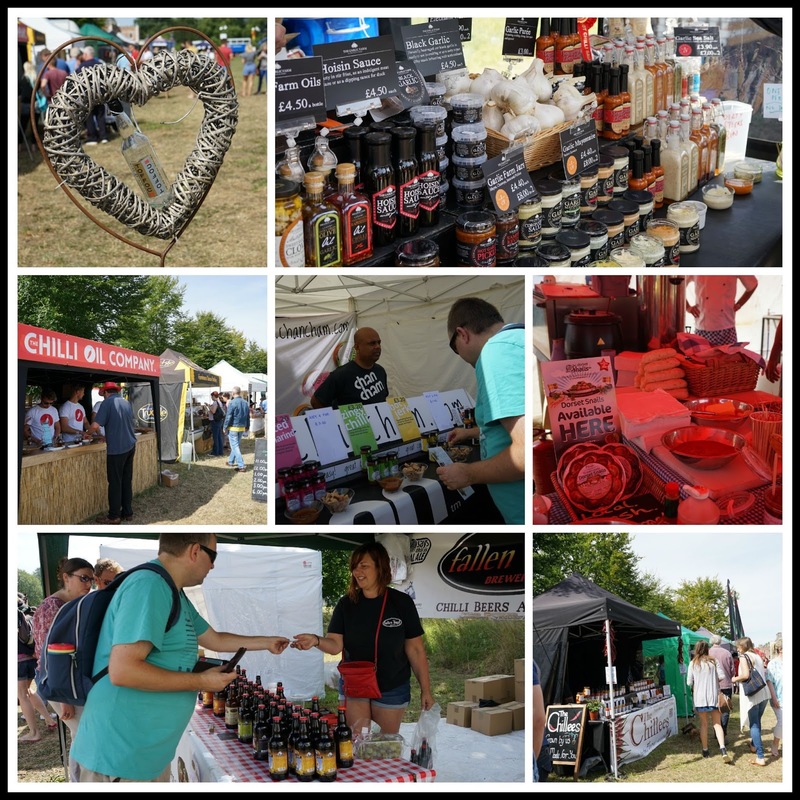 One of our favourite things to do in the Summer is visit a food festival and fortunately in Dorset, we have lots to choose from! 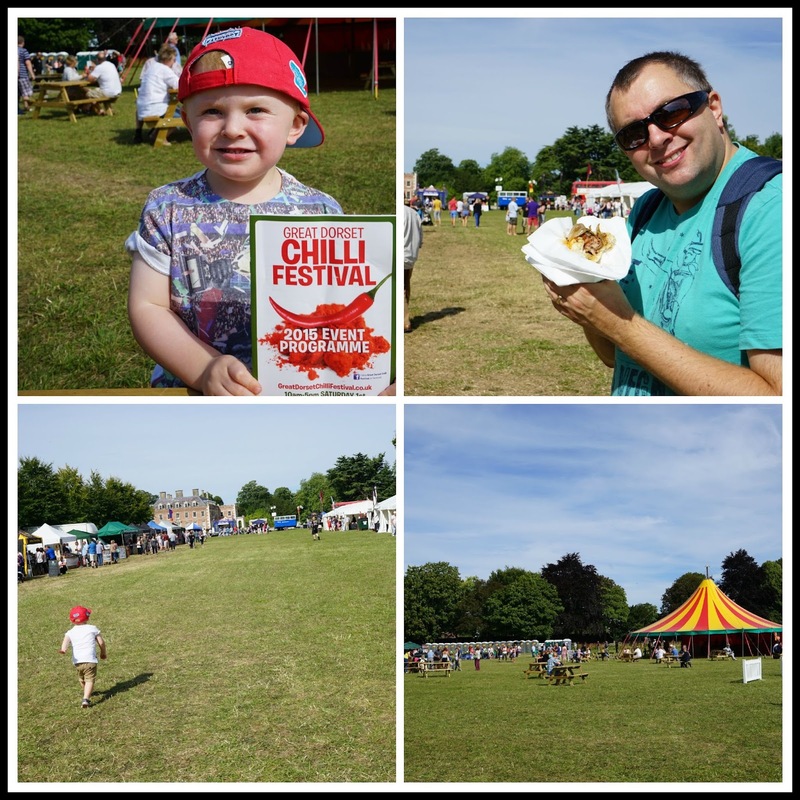 Last weekend we went along to The Great Dorset Chilli Festival - now in it's 5th year, it's a mecca for chilli enthusiasts and great day out for the family. 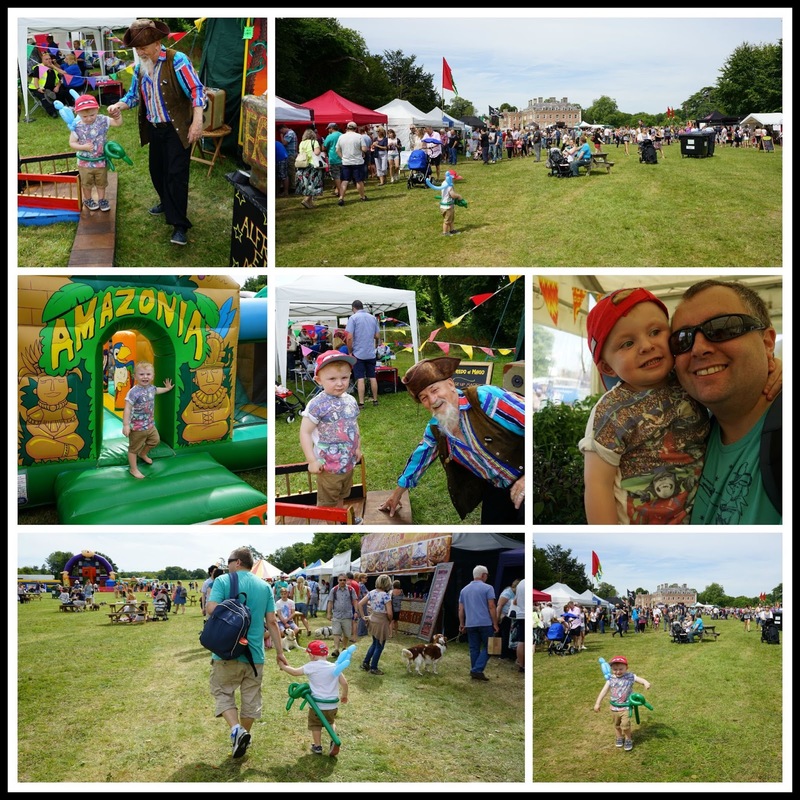 It was a beautiful day and perfect weather for a festival! The festival was on all weekend but we decided to go along on the Sunday morning. The gates opened at 10am so we arrived shortly after and managed to park relatively close to the entrance. (The later you arrive, the further away you have to park!). Tickets cost us £7.50 per adult with kids under 10 going free which is very reasonable. We were given a map/guide as we arrived but we just decided to have a wander round as it was still pretty quiet. My husband had skipped breakfast so the smells of the food stalls enticed him into buying a wild boar hot dog to stop his tummy rumbling! It may be the Chilli Festival but there were lots of other food options available that weren't quite so spicy. His hotdog tasted delicious and I was half tempted to buy one for myself even though I'd already had breakfast! The festival has certainly grown lots since our last visit in 2013 and there were lots and lots of stalls to look round. There were chilli oils, chilli sauces, chilli beer, chilli chocolate, deep fried chillies, dried chillies, chilli ice-cream.....basically any chilli product you could ever wish to buy! I bought some cheese, red onion and garlic bread which looked and smelt amazing whilst my husband was loitering at the chilli beer tent. 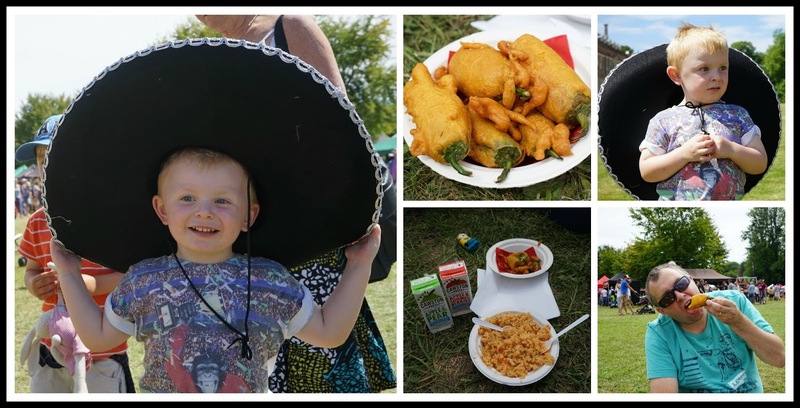 Aside from all the lovely things to buy and eat, there was a jam packed itinerary for the day featuring cooking demonstrations, a chilli sauce competition, chilli talks, live music, falconry displays and a chilli eating competition. Not for the faint hearted that one! The festival was starting to get really busy towards lunchtime so we decided to grab an early lunch and meet up with our friends who were there too. Paul was still full from his big hot dog but he did manage to eat some deep friend chillies! Elliot and I shared a big bowl of freshly made paella which was really really nice, much better than my paella attempts at home. After lunch we finished looking round the stalls and my husband bought some chilli oils and some chilli pork scratchings. (He ate these last night and they blew his head off!). He also bought Elliot a giant sombrero - just what every toddler needs! Elliot was making us laugh by dancing to the mariachi band, his sombrero was bigger than him! I'm also a big fan of anything hot and spicy. Looks great! When I saw this post I was immediately reminded of one of my favourite Simpsons episodes where Homer goes to a chilli festival. I do really fancy going to one myself. Looks like you had lots of fun anyway! 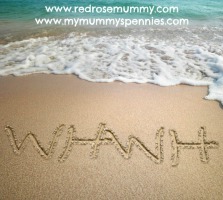 Thanks for linking up to #SummerDays again! I'm not really a chilli person but my other half would love this. He's been trying to grow chilli plants this year and he's very proud of the solitary chilli that they've produced so far. This look HOT (pardon the pathetic pun). I'm growing chilies this year so I have an unusual interest in them. Those deep-fried chilies have my mouth literally watering!